This website contains a description of part of my theory of everything, whereby everything in the universe is explained in terms of its single constituent, indivisible compressible spacebubbles. It might seem surprising that such a theory would lead directly to predictions of the masses of particles and the strength of nuclear forces; but if you read my book or check out my Research Paper, you will find that it does so in a very simple manner. Here is the first picture of a proton, without a quark or a gluon in sight. 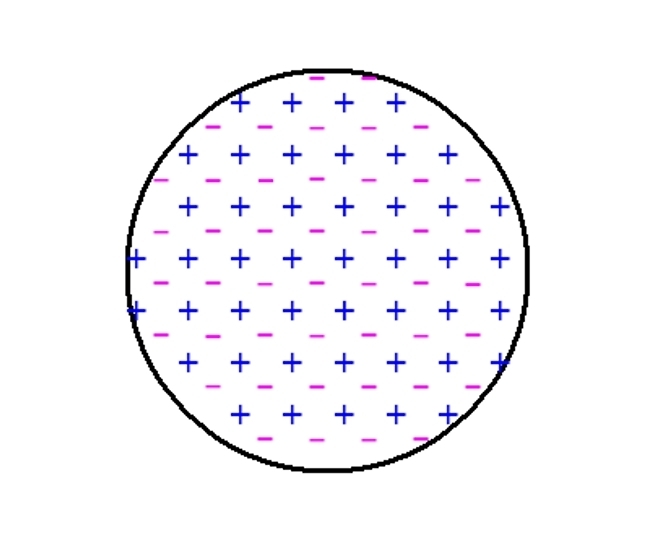 It is not intended to convey the detailed structure; but merely to illustrate the idea that all particles with rest mass, are a mixture of alternate positive and negative charges (except electrons and positrons, which are lone charges). The particle is held together by the binding energy resulting from the fact that opposite charges are always closer than similar charges. 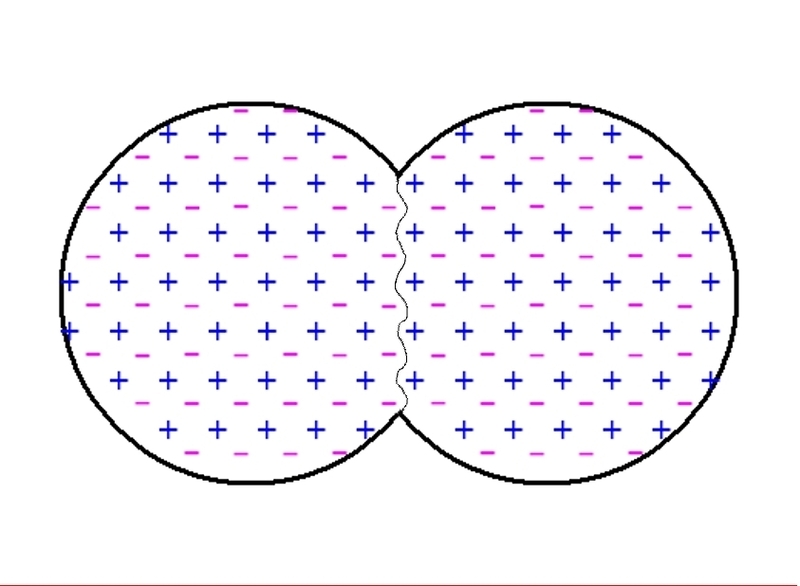 The diagram below illustrates how protons and neutrons are held together in the nucleus of an atom, by the interactions between surface charges, thus unifying the strong nuclear force with the electric force. Squish Theory v. String Theory, the battle of the theories. Here is an impartial overview of the relative merits of the two theories. In this category String Theory wins hands down. Humans like to believe that the universe is mysterious and unknowable; and String Theory with its 11 different dimensions has heaps of mystical appeal. So too does the meaningless statement, that different particles are just different vibrations of the strings. Squish Theory has no such appeal, as nothing could be more simple and mundane than a universe composed solely of spherical spacebubbles. Not only is it boring, it is also unoriginal, as the wisest of the Ancient Greek philosophers realised this was the only possible universe over 2000 years ago. Here again String Theory triumphs. It is true that many years ago Richard Feynman said of string theory “I do feel strongly that this is nonsense”; but things have moved on, and even if there was a physicist of Feynman’s calibre around today, the fact that string theory has become so well established, would probably protect it from any such criticism. It is not just the established nature of String Theory, that makes it acceptable to physicists; it is also that since it makes no predictions, it therefore cannot contradict anything that physicist enjoy believing in. Squish Theory on the other hand is a physicist’s nightmare. Any new theory is always going to upset people, but a theory produced by a heretic with no ties to the physics communion is perhaps the ultimate blasphemy. Although Squish Theory does not seriously contradict very much of physics, what it does contradict is inevitably that pseudoscientific nonsense to which physicists have the greatest religious devotion. This is the only section in which Squish Theory prospers. String Theory makes no predictions about anything. Indeed it has been said that String Theory’s only achievement in the last 60 years, has been to successfully string the funding authorities along, year after year. Squish Theory on the other hand makes numerous testable predictions. For instance the concept that all massive particles are made from a combination of electric charges, correctly predicts that all particles will either disintegrate on their own, or can be smashed apart in the case of protons. Except of course for electrons and positrons, which being single charges, can only unravel if they encounter one another. Squish Theory also explains what physicists term ‘the imbalance between matter and antimatter in the early universe’. In Squish Theory there is no real distinction between matter and antimatter, rather what Squish Theory predicts is that the universe must always contain exactly the same number of positive and negative charges. Each big squish produces a random sample of particles, most of which would be unstable and therefore unravel on their own. This would leave a universe containing only protons, electrons, positrons and anti-protons; which would then unravel with each other to leave an excess of either protons and electrons, or anti-protons and positrons. Since there are always the exactly the same number of positive and negative charges in the universe, Squish Theory also accurately predicts that there should be exactly the same number of protons as electrons. Final verdict. All things considered, it seems almost inevitable that String Theory will go from strength to strength, and Squish Theory will continue to be ignored. How to recognise a crackpot physics theory. As a general rule, to decide whether something is a crackpot physics theory, we need to ask two questions; is it physics, and is it a theory. If the answer to both is ‘yes’, then the chances are it is, because almost all theories about the universe ever produced are nonsensical. So rather than look at the features of bad theories, I will start by examining the greatest scientific theory of all, and identify the features of a proper theory. The theory I am going to describe as the epitome of scientific brilliance is the idea that everything in the universe is made out of just protons, neutrons and electrons. It is a theory that nobody, however clever, could have worked out from first principles, even if they had all eternity to think; rather it required ingenious experiments, coupled with creative insight. Physics professors routinely complain about receiving letters from crackpots, telling them that relativity is wrong; but apparently not even a crackpot who lacks discourse of reason will dispute the theory of atoms. This is because when a theory is correct, and mostly complete, then it does not get seriously criticised; and the theory of atoms, which explains just about everything under the sun, certainly is such a theory. Physicists have isolated protons, neutrons and electrons, so they have conclusive proof that they exist. They have also measured the masses of these particles, and used the values to accurately predict the masses of the hundred atoms known to exist, allowing for a small amount of binding energy. Back in the 18th century, physicists invented a substance called phlogiston, to explain why things burn; and a substance called electric fluid to explain electric forces. These substances are no longer in existence, because atomic theory explains away the phenomena in terms of the fact that electrons and protons attract, whilst like charges repel. The forces between electric charges also generally explain why individual atoms stay together, how molecules form, where the energy comes from in nuclear fission, and how photons are created and absorbed. Atomic theory is based on three particles, all known to exist, and on simple electric forces, which can easily be demonstrated with a few balloons; yet it explains just about everything under the sun. That is the true nature of the universe; for all its apparent complexity, it is actually a very simple organism. Having come up with such a superb theory of atoms, you might think that physicists would be intent on finding an equally splendid theory of particle physics; but not a bit of it, in fact the current theory of particle physics does not even rank alongside phlogiston. For whatever reasons, physicists decided to believe that protons and neutrons are made from three quarks. A very odd assumption to make, seeing as a neutron decays into a proton and an electron. To test for quarks, protons were collided at high speed, so that they would break apart, and the quarks could then be weighed and measured for charge. An excellent experiment to try, and the technology behind such experiments is certainly one of mankind’s greatest achievements. However the experiment produced no quarks; a very good reason, one might think, to ditch a bad theory. However that did not happen, instead the authorities decreed that quarks could not exist outside of particles. This of course means that physicists have the luxury of giving quarks just about any mass and charge they feel like, and there is no way that these values can be directly disproved by experiment. Hundreds of different types of particles have been created in accelerators, and if their masses were known to several significant figures, then maybe that would be able to prove quark theory right or wrong? Actually it would not, because quarks are not given definite masses; instead particles with very different masses are believed to be made of the same three quarks. 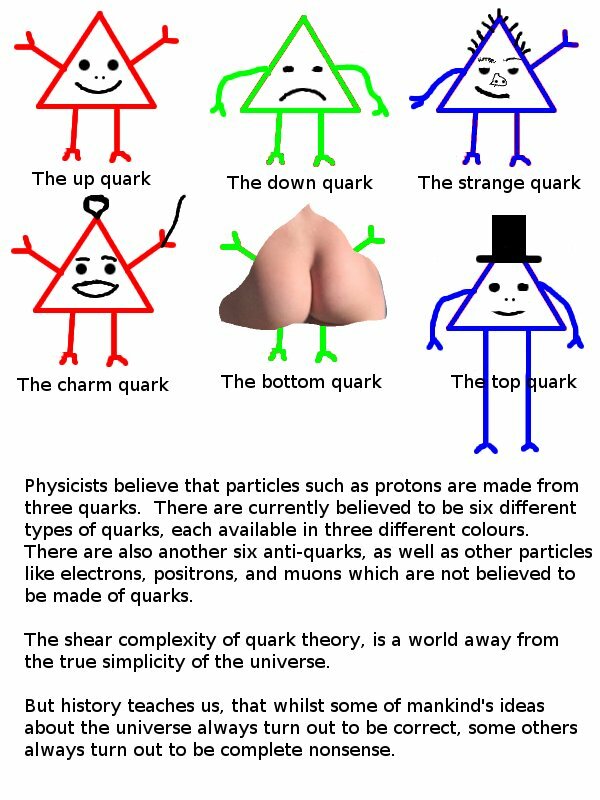 So not only is quark theory effectively unfalsifiable, but it does not do the job it was designed for, that is to explain the masses of particles, not even with the help of its imaginary friend the Higgs boson. 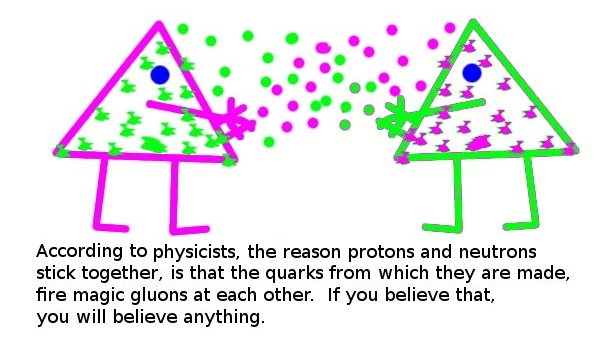 Also quarks themselves do nothing to explain why protons and neutrons stick together in the nuclei of atoms; which is why they are always accompanied by yet more imaginary beings, known as a gluons. Despite all these shortcomings, perhaps the worst feature of quarks, is that they come in six different varieties, along with another six anti-quarks, all available in three different colours. Yet still they do nothing to explain the other particles such as electrons, positrons and muons. The thing to note when comparing the Squish particle theory to quark theory, is that had history been different, and say Feynman had explained all of particle physics in terms of positive and negative charges; then not even the most deranged of crackpots would have ventured to suggest replacing it with a theory containing dozens of elementary particles. Yet such is the religious nature of humans, that even physicists so deluded that they believe in time travel, realise that they can condemn my theory as the work of a crackpot, in the sure and certain knowledge that they can rely on the support of the rest of the human race.